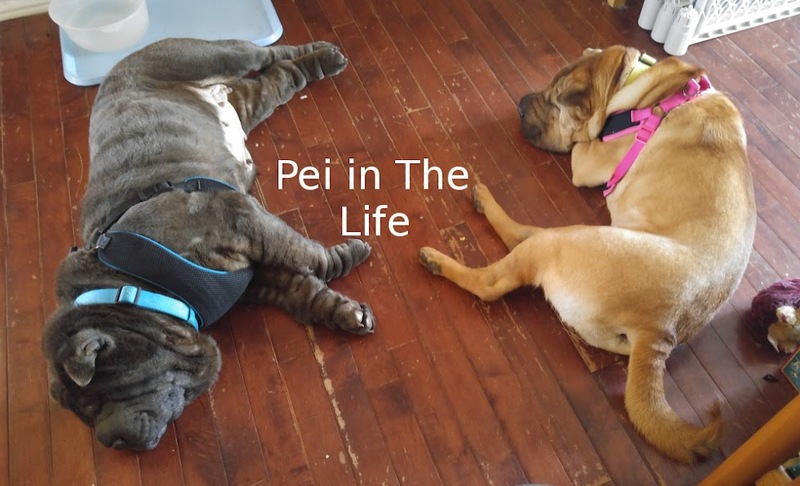 So my good friend Miss Lola Shar Pei expressed an interest in looking after Puppy for a bit. So I tried to pack him off to her. I even packed him some of his piddle pads (-I- was house trained at 8 weeks, I don't know what's taking HIM so long). Then Mom caught me and started getting upset saying she would miss him yada yada yada. Blah blah blah. Then she gave me that look that said it was all my fault. I tell ya, does this look like a Pei who is to be blamed for something? Sorry Lola, guess Puppy isn't going to visit. Maybe we can send FlatPuppy and Flat Bolo instead. Bolo, I'm very disappointed in you that you would have tried to ship Puppy off. You are the senior brofur and should act more mature. Human puppies require more care because they take longer to mature than dog puppies so you have to make allowances. Now, Bolo was just trying to do me a kindness. I feel terrible that he would be blamed for his good intentions. He didn't plan on my KEEPING the kid. The very first thing he said when he made his kind offer was that his Mom would want Puppy back eventually. Anyway, I'm very sorry I kind of got you in trouble, Bolo. It was a very nice thing you tried to do and I'll be forever grateful for the attempt and the thought. Seemed like a good idea to me. Sorry it didn't work out for you. Well, from his smile, Puppy seemed to like the idea! As for that photo of you, Bolo, it is the face of a true saint! Bummer! You and Puppy seemed so excited, and you certainly packed thoughtfully! I've been talking with Lola over this issue and she's unconsolable. She thinks you're still in trouble. I personally think that your solution is pawesome because I read somewhere that Flat Puppies don't poop.